Do not open long-sealed tomb. Not on one, but surely all. That evil guards with six-fold eyes. Follow where alone he goes. Above, the prize. Below? Who knows? As Richard and Melek gape in astonishment at Melek's sudden disappearance, the stone from which the scribe had fallen tips back into place. Orkan proceeds to prod the area where Melek disappeared, but Richard warns him not to get too close. With caution, they search the area, but all they can find are Melek's glasses. Unable to find anything on the hilltop, they climb down the slope and search the hill base, but they find no sign of their friend. After a while, they regrettably abandon their search. Orkan bemoans the loss of the Book of Prophecies; Richard quickly snaps at him for dismissing Melek over the book. 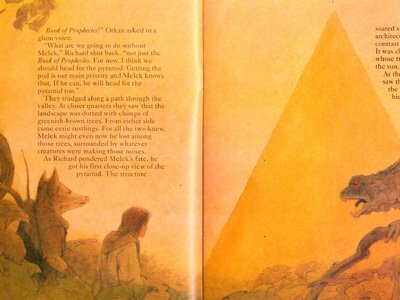 Hoping Melek would head for the pyramid wherever he was, Richard leads Orkan down to the valley floor, through dense trees. The pyramid grows closer with each step, the details of its shiny surface becoming more clear as the distance shortens. Upon reaching the pyramid's base, Richard pulls out the Path Finder and point it at the structure, walking around the building to find an entrance. Eventually the arrow glows at a slab at the base, but Orkan and Richard can't get it open no matter how hard they push. They think for a moment and consider that maybe the actual entrance is a little higher than they think. Looking up, they see an indented slab in the pyramid. Orkan climbs on Richard's shoulders and feels out the slab - a soft click is heard and the slab slides open. Orkan climbs into the newly opened passage and pulls Richard up to him. The two of them then head inside a lobby, a door on the far end. They head for the door, but their progress is halted when the floor beneath them suddenly descends, taking them with it. The floor carries them down like an elevator, carrying them deep into the structure's basement, before the lift finally slows down and stops. Richard and Orkan find themselves in a new chamber, which possessed only one item: a block of stone covered by a flat lid. Without consulting the Path Finder, Richard believes the pod is inside the stone tomb and heads toward it. The lift that brought them to the chamber heads back up as the duo get off, leaving them trapped inside with no noticeable way out. Upon reaching the tomb, Richard begins looking for a way to open it. As he does, Orkan heads a sound on far end of the chamber and looks over the tall stone block. To his horror, a three-headed lizard-like creature is approaching the tomb from the center of the chamber. The strange beast sees Orkan and immediately charges. Just as Orkan orders Richard to get away, Richard suddenly finds a switch on the tomb and presses it. The lid of the tomb begins to open. The three-headed creature sees the tomb opening and stares in horror before without warning turning and running to the far end of the tomb, disappearing without a trace. Richard, who didn't see the monster, is forced to hear Orkan reveal what had happened, and both wonder why the monster turned tail. Before they could discuss it further, they hear a sound near the lift. The stone elevator suddenly drops down and a figure steps off, sending the lift soaring back up. It's Melek, calling out for Richard and Orkan. His friends, stunned to see their friend back, rush over to him, asking him where he had been. Melek tells them that the slide had taken him into a maze of underground tunnels. Through sheer luck, he had managed to find an exit, after which he could consult the Book of Prophecies. He had then rushed to the pyramid to warn his friends not to open the tomb. Melek was able to read the inscriptions on the pyramid's outer wall, and the hieroglyphics tell exactly what curse is upon the pyramid. 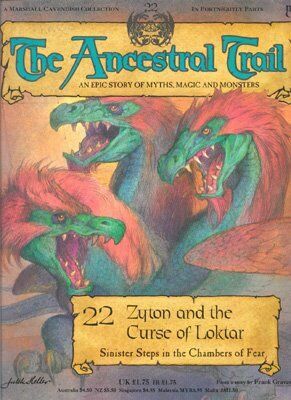 The tomb is that of a man called Loktar, guarded by a three-headed monster called Zyton. Should the tomb be opened, a self-destruction mechanism is activated that will cause the pyramid to sink into the ground. Melek quickly realizes from Richard and Orkan's horrified faces that the tomb has been opened. The three quickly try to close the half-opened slab, but the mechanism won't allow them as a death-like stench wafts from inside the stone. 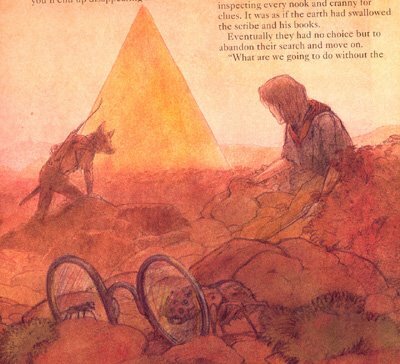 Richard remembers Zyton's escape and the three of them head to where the creature had disappeared. 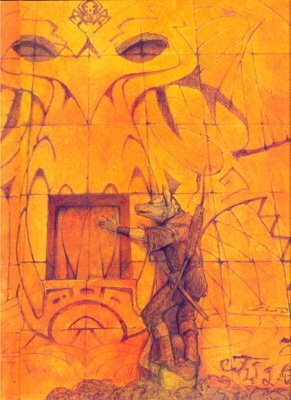 A quick search of the floor leads them to a worn stone tile, and when Orkan presses it a door opens in the wall. The three enter the new passage to a flight of stairs and Richard presses another switch to close the door. 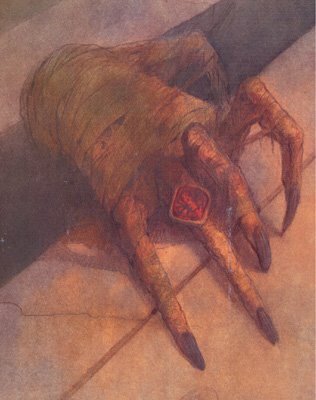 As he does, he notices a hand emerging from Loktar's tomb. The trio head up the stairs as swiftly as they could, but it doesn't take long for them to hear the sound of the door open at the bottom of the stairs, the stench of Loktar's rotting body signaling his corpse is chasing them. The three press on until they find themselves at a dead end. Richard quickly pulls out the Path Finder and quickly finds it glowing upward. They look up and see a metal grill just above their heads. Wasting no time, Richard unbuckles Kika's belt. The magical item shoots up and wraps around the bars before lengthening downward for Richard, who gives the belt a sharp tug. The tug causes the metal bars to burst apart, providing a way out. Richard goes first and climbs out onto the edge of the pyramid. To one side he sees his prize: a Life Force Pod, sitting in a small niche. He grabs the pod and pockets it. As he takes the pod, the pyramid suddenly begins lurching and sinking into the ground. 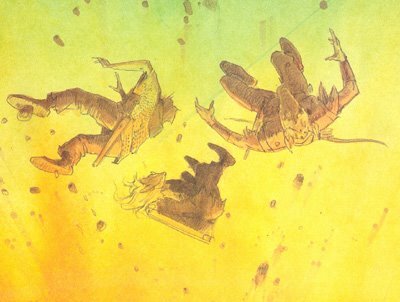 Orkan and Melek climb out of the passageway to join Richard, and moments later the cadaver of Loktar arrives below, staring up at the companions with his empty eyes. A sudden lurch in the pyramid throws Loktar off balance, sending the corpse barreling back down the stairs. Moments later, hot air blasts from below the pyramid's base, growing in intensity. The three try to hang on, but eventually the winds become too strong for them to hold on and they're lifted into the air. Zyton is a three-headed lizard-like creature that lives within the pyramid that houses the tomb of Loktar. Zyton's purpose is to guard the tomb and prevent anyone from opening it, thereby causing the pyramid to destroy itself. Little else is known about Zyton, except that it appears intelligent enough to recognize when it's life is in danger from the pyramid's self-descrution. "Advancing towards the centre of the room was a strange creature, a half-bird and half-reptile. Its lower body was that of an iguana, but a pair of wings sprouted from its shoulders. 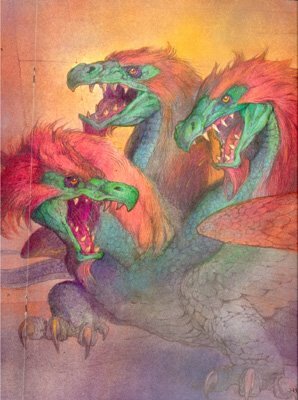 Three separate necks, scaly at the base, became more feather towards the top and each ended in a head equipped with a curving, toothy beak and glittering gimlet eyes." The twenty-second volume of The Ancestral Trail offers up one of the more bizarre and esoteric portions of the story thus far. The monster-of-the-issue for this issue, the bird-lizard creature Zyton, is barely even in the story, and when he does appear, he does little beyond getting spooked and running away. 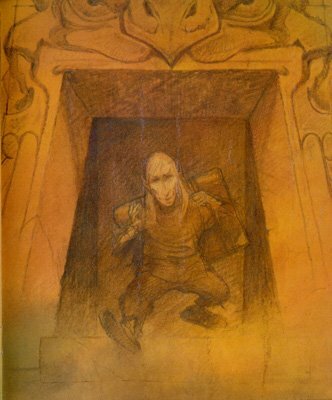 By the way the story is structured, Zyton is most certainly a creature that was around before the Evil One appeared - he is, after all, guarding the tomb of Loktar. And when Richard and friends came alone and opened the tomb, Zyton took off and is never seen again. One wonders where Zyton is now? Is he terrorizing the nearby countryside now that his job is finished, or did he die without a master to control him? The discussion of Zyton of course leads to Loktar. Who exactly is Loktar, and what kind of person was he to build a booby-trapped pyramid as a tomb? We never find out, but we can guess. We can guess he is of magical origin, as his corpse is reanimated when the tomb is opened. Is he an ancient sorcerer, or perhaps a mad wizard? Again, we never find out, and perhaps it is for the best. Leaving something vague like this gives The Ancestral Trail a bit of history that we can fill in the blanks with our own imaginations. "If you go on like that, you'll end up disappearing like Melek! We don't know how that trap was sprung and there could be more waiting for us." Orkan: "What are we going to do without the Book of Prophecies?" 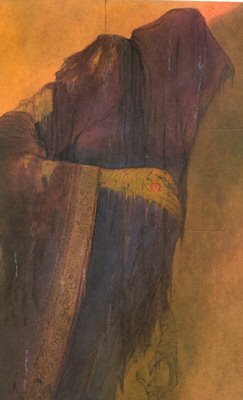 Richard: "What are we going to do without Melek, not just the Book of Prophecies. For now, I think we should head for the pyramid. Getting the pod is our main priority and Melek knows that. If he can, he will head for the pyramid." Richard: "The pod's in there, but the entrance is hidden. Orkan, where would you put a door so that people wouldn't find it?" Orkan: "Where they couldn't get at it. Maybe higher up the pyramid?" "You haven't opened the tomb, have you?"